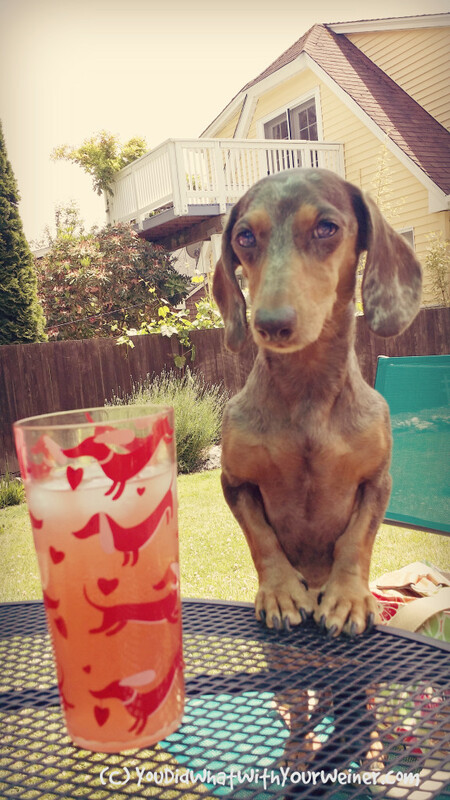 Enjoying a weekend barbecue with your pup is a lot of fun. Today is the first day of summer so you are likely to host one, or attend one, soon. Dogs often end up eating the food at the barbecues too. Sometimes it’s unintentional – they steal food out of the garbage or manage to snag it off of the table. Sometimes it’s quasi-intentional – you don’t intend for your dog to eat the people food at the barbecue but Uncle Joe, or one of your friends, just can’t help sneak fido some snacks. I like to host barbecues where there is food that both people and dogs can eat. I usually set up a separate table and let my guests know that anything on that table is safe for dogs. When it comes time to eat, I will make my dogs a little plate of food so they can eat next to us at the table (on the ground). There are a lot of typical barbecue foods that your dog can eat. They can have celery and carrots (without dressing) from the veggie tray, sliced watermelon or cantaloupe (without seeds or rind), cheese, or an unseasoned hamburger patty or chicken breast. Dipped Strawberries With Toasted Coconut Honey Oats – a great desert treat that you can share with your pup. Be sure to remove the sticks before you give it to your dog so they don’t eat the wood splinters. Healthy gluten free chip and dip alternatives are Strawberry Chips With Banana Dip (I like to add a bit of dates to the banana dip to sweeten it up a bit) or Banana Chips with Peanut Butter ( I prefer to use greener bananas). 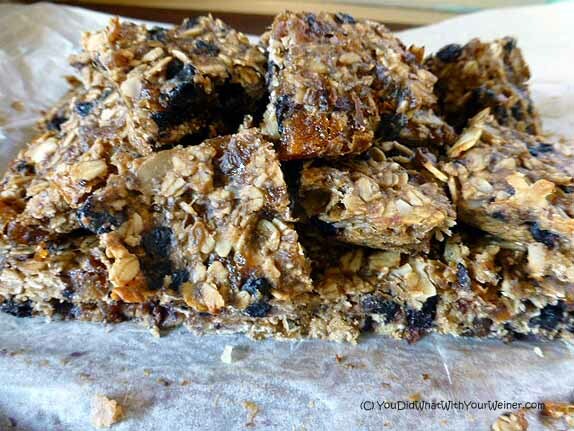 Homemade Energy Bars – These yummy bars are good for both the back yard AND the trail. They’re almost like a desert cookie. No Mayo Healthy Chicken Salad – This dairy free chicken salad is almost as tasty as the fat-ridden mayo kind. Turkey Meatballs With Cranberry Mustard Dipping Sauce – These appetizers are easy to make and pack a strong flavor punch. Apple Peanut Butter Rings with Granola – these are crunchy and sweet and take zero cooking. Grilled Sweet Potatoes With Lemon and Dill – These are a great side dish if you are barbecuing salmon or another kind of fish. There are, however, several foods typically found at a barbecue that should be kept away from your dog because they are toxic or harmful. If these foods are at the barbecue, you should let your friends know that you dog absolutely cannot have these (another reason I love to bring them stuff my dog CAN have so I can direct them over there). Read this article on Pet360 to find out more about foods that are poisonous to your dog. If you suspect your dog has eaten something poisonous, please contact your veterinarian or the Pet Poison Helpline (a $39 fee may apply). Bunny is very disappointed that you didn’t put steak on your list! lol You have some great stuff on your list! Mmm this is making me hungry! Especially the sweet potato one. Great idea btw. Dogs are popular guests at bbq’s. My dogs agree with Bunny…Steak, burgers, hot dogs!!! But they probably need to experience more of a variety than just what they would choose. Thanks for the ideas. Thanks for these! Since our new house has a pool and big backyard, we can actually host events in the summer! We close on our house 6/30 and my brother will be on leave from the Army in July, so it will be perfect timing. I’ll be making some of these for our pool party when my bro is home!